It’s also got nuts and chocolate chips which provides a sweet surprise. 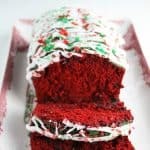 Moist, red and chocolatey! And it’s not hard to make! Start by mashing up a bunch of very ripe bananas. 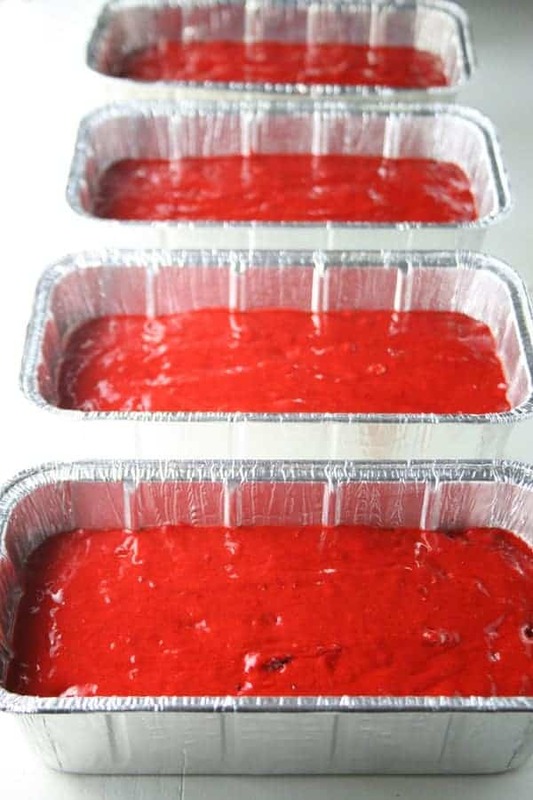 Mix up 2 red velvet cake mixes with oil, mashed bananas and eggs. Then stir in chocolate chips and chopped walnuts. 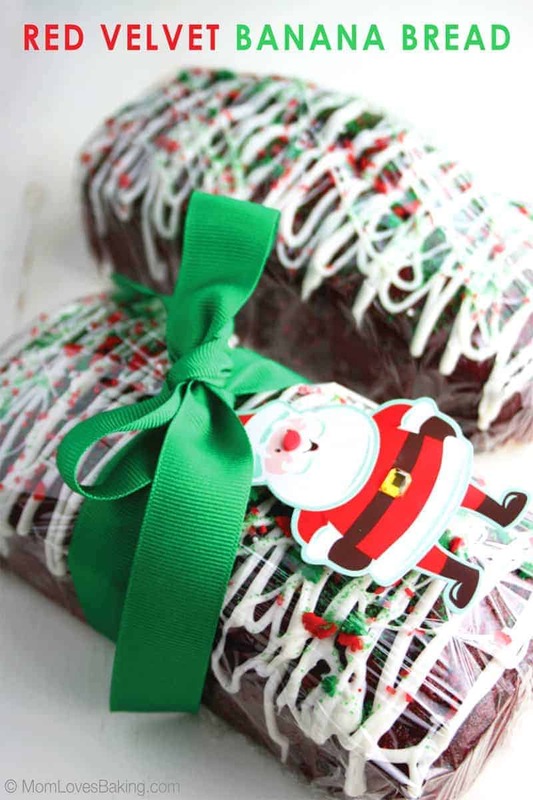 I used small foil loaf pans and lined them with parchment paper. Then sprayed the pans with cooking spray and added the batter, about two thirds full. This recipe makes 5 loaves. Bake at 350°F. for about 40 minutes. Let them cool, then drizzle with melted white chocolate. And top with Christmas sprinkles. Let the chocolate set. It only takes about 30 minutes. 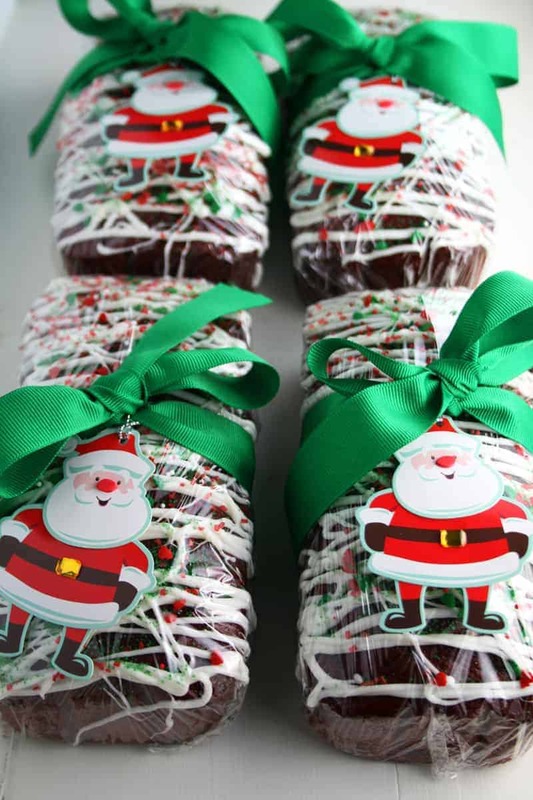 Then wrap with clear plastic wrap, tie a ribbon around it and add your gift tag. I hope my neighbors like their Red Velvet Banana Bread! I made a couple of batches, so of course I did plenty of sampling. It is simply scrumptious! Preheat oven to 350°F. 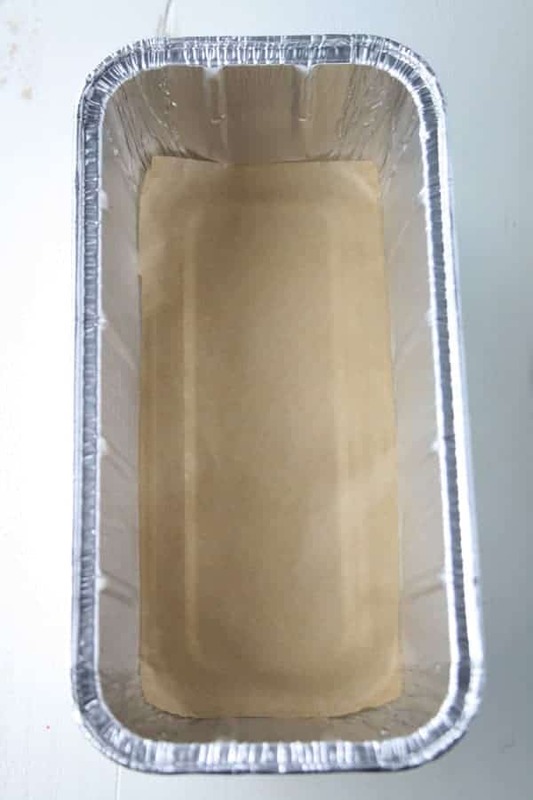 Line 5 (8" x 3 3/4" x 2 1/2") loaf pans with parchment paper. Spray with cooking spray. Set aside. beautiful Christmas gift & yummy too!! I think this would make an awesome gift for your coworkers, and other special friends. Can this be frozen until needed? 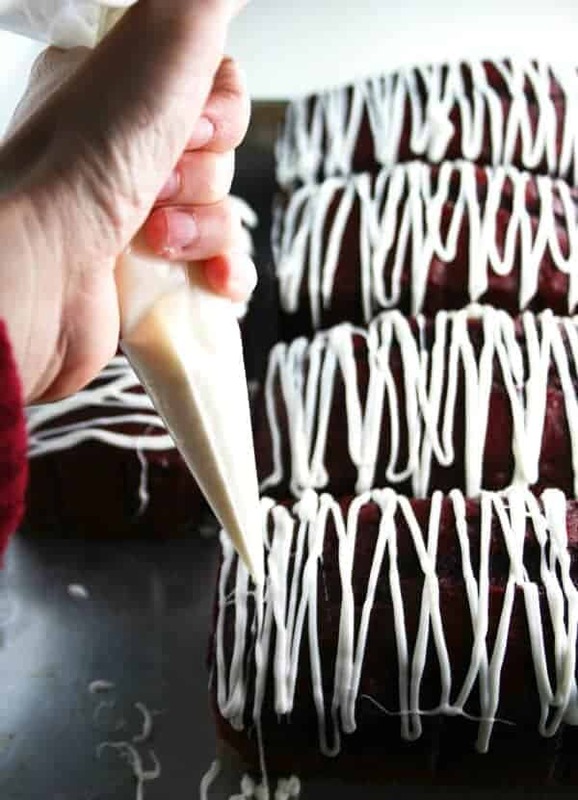 You could freeze the red velvet banana bread without the chocolate drizzle. Why do you need parchment paper? To keep the bread from sticking to the pan. You don’t have to use it if you don’t want to, but make sure to grease the pan really well or spray generously with non-stick cooking spray. Parchment paper keeps the baked good from sticking in the pan. It eliminates the problem of having pieces your baked good sticking and breaking off. Is the oil listed on top of whatever is needed for the boxed red velvet cake mix? No, the recipe states the total amount of oil needed for the bread. You don’t need to add extra. Not an experienced baker but like to make recipe using tradional loaf pan. How long should I bake? You could use a 10″x5″ loaf pan and make two loaves or half the recipe and make one loaf. I would bake at 350°F. for 40-50 minutes or until a toothpick inserted into the middle of the bread comes out clean. I would check it at 40 minutes. I would think a regular size loaf pan would take about an hour or maybe a little more. Check doneness with a toothpick. I’m planning to NOT use a cake mix. is it possible/ and what is its equivalent to home made mix? Hi Mika, I have not tried this recipe from scratch. I’m sorry I can’t be of more help. Let me know if you can figure it out. Good luck! This recipe looks so good. I really want to try it. Please guide me as to how many cups of RED VELVET MIX i should use? 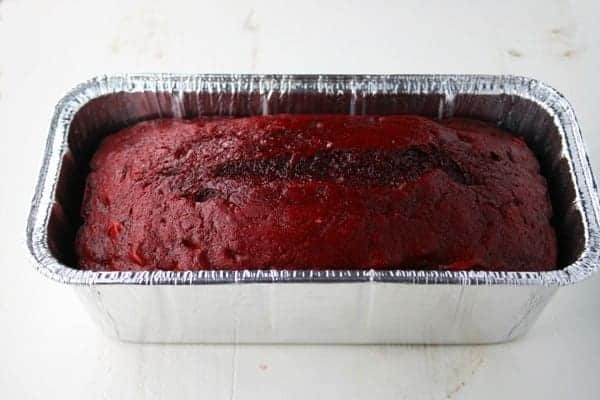 Hi Emiliana, If you scroll to the bottom of the post, you will see the complete recipe for Red Velvet Banana Bread. Enjoy! Store at room temperature for 24 hours or in the refrigerator for up to 5 days. Is there water in this recipe? I’m counting the first five ingredients and it includes the chocolate chips then? But then it says to stir those in with the nuts? Hi Becky, There is no water in this recipe. 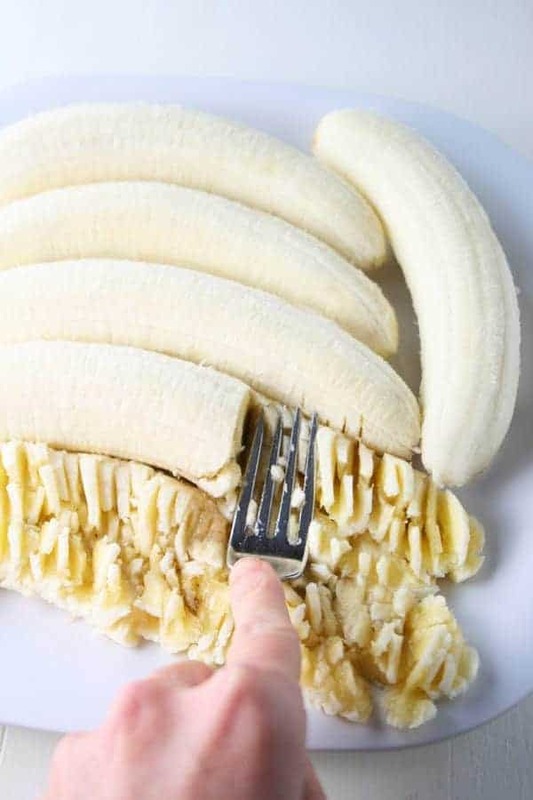 The bananas replace the water that’s normally added in a cake mix. Hi Lise, thank you for replying to my inquiry. Yes I saw and read the complete recipe. It did say 2 Red Velvet Mix. I’m sorry but the Red Velvet Mix I see around comes in different packaging, different quantity. Please let me know in terms of measuring cups the amount of Red Velvet Mix I should use for this very interesting recipe of yours. I’m a new baker. I’m so eager to try this out. I want to give it as gifts to friends. Hi Emiliana, I’m so glad you want to make my recipe. I’m sorry that I don’t know the exact amount of cake mix per box. I did use a 16.5 ounce box of Duncan Hines brand Red Velvet Cake Mix. I’ve provided a link on the post if you want to order them from Amazon. Or perhaps you have a scale? You could weigh the mix you are using. Good luck! 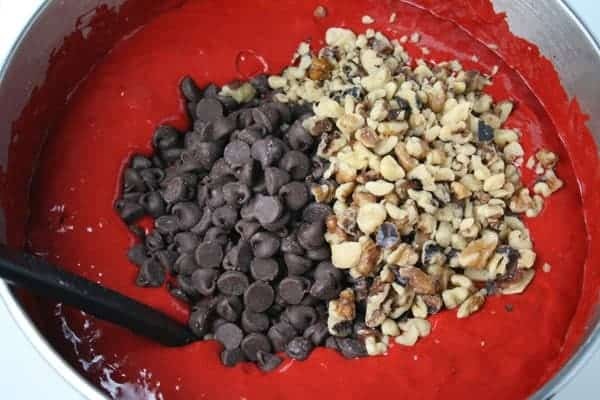 Place first 4 ingredients not 5 in a large bowl, Mix with electric mixer. Then add chips and nuts. Right? Or am I missing an ingredient? First 4 ingredients (sorry about the typo, I’m correcting it now). After baking, how long should I let the bread cool in the pans? Until they are completely cool. Depends on the temperature of your house. Maybe 30 minutes to an hour. The recipe says it yields 5 loafs, but in a comment about you said it yields 2 loafs in a 10×5. Does that mean it makes 5 mini loafs? To clarify, this recipe will make five (8″x3.75″) loaves or two (10″x5″) loaves. I don’t want to use nuts… should I add more chocolate chips, substitute with M&Ms, or just leave them out? Does the chocolate not stick to the plastic wrap? My concern is that it will or it’ll smear and want it to be this cute. 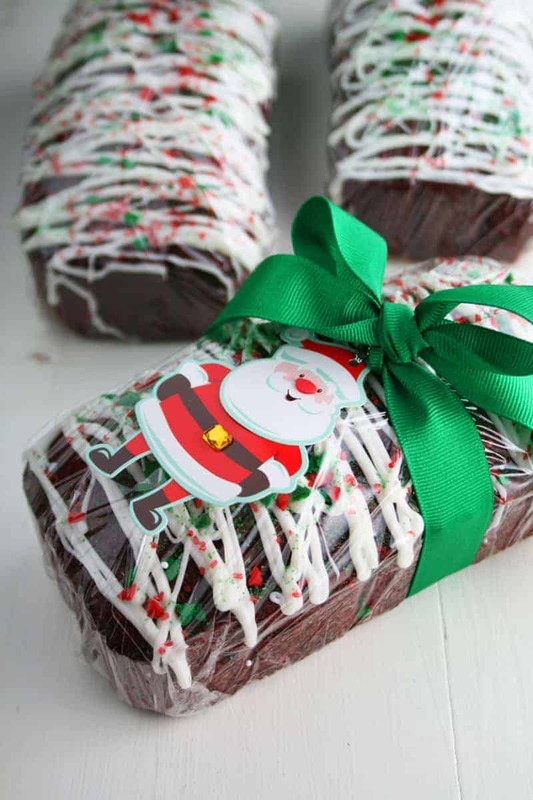 If you put the bread in the refrigerator after drizzling the chocolate, then it will firm up and not stick to the plastic. How much- in cups- for 6 bananas? Two cups of mashed banana = 6 bananas. If I want to make only one loaf what are the measurements? Half the recipe and use one 10″x5″ loaf pan. Is that 40 mins in the oven for all 5 loaves together or each one at a time? Sorry. Not an experienced baker. Yes, 40 minutes for all 5 loaves, if you can fit them all in your oven or until a toothpick inserted in the middle comes out clean. Can you use olive and or grapeseed oil! I think you could use olive oil. Not sure about grapeseed oil, I’ve never used that before. 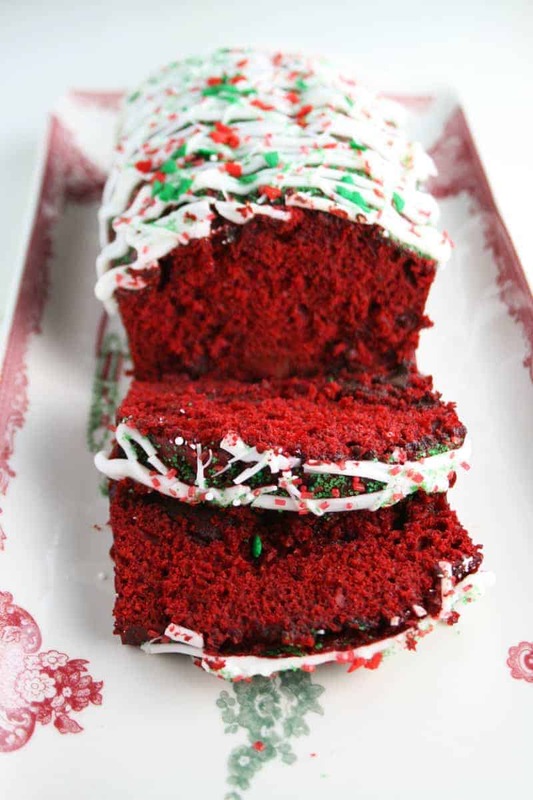 I am making this now, but omitting chocolate chips, Frosting, candies. I substituted butter.. because I had grabbed wrong recipe, AN started, AN had butter out, an semi melted. So switched right recipe, put dry mix done did aside for another time. AN started this recipe.. If the batter tasting fantastic alone doesn’t say something, I hope cake does, because batter alone was great. Hope it turns out great. Enjoy! I’ve made 15 loaves of this now for neighbors, friends and my husbands coworkers! It’s a HUGE hit! Thank you so much for sharing and Merry Christmas!!!! Hi, do 3 bananas equate for 1.5 cups of water? I’m using a different cake mix and the ingredient amounts are a bit different. Thanks! If you’re using one cake mix or half of this recipe, then I would use 3 bananas or 1 cup of mashed bananas. Enjoy! Hi I am making mine as we speak. I ended up using the mini loaves pan. I had a total of 10 with this. Love this recipe!! I will be making more for my coworkers and for my family they love it! Omg I am in love!!! ??? 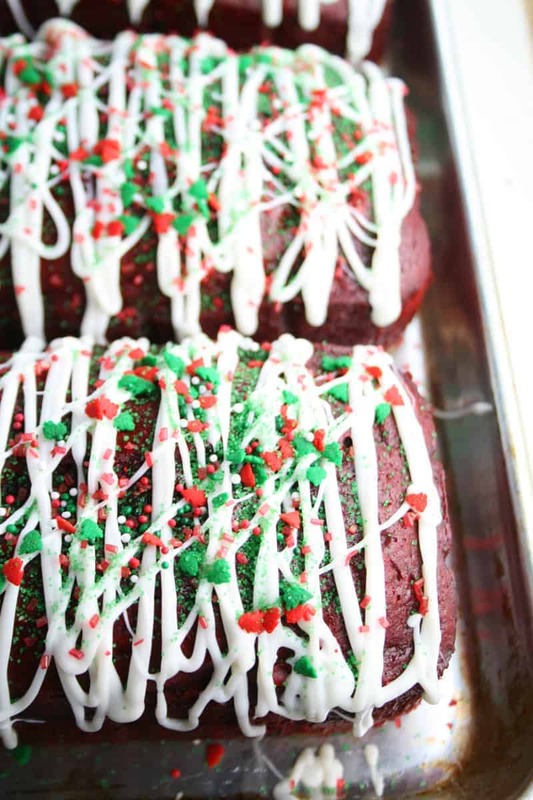 Your red velvet banana bread was soooo good! So good I had to write about it and share it with everyone I know lol ???. Here’s my blog post link http://www.bit.ly/foodiefiles. If anyone hasn’t made this yet make it! You won’t be disappointed!